Jan Stuivinga, sometimes spelled Stuyvinga, was born in Zwolle on Oktober the 26th 1881 into a protestant family that had its origins in the north-eastern provinces of the country. His father R.P. Stuivinga was an overseer and his job eventually took the family to Maassluis, Zuid-Holland. The father worked there as a municipal architect until 1895 and later became an inspector of housing at the Bouwpolitie ('building police') department in Rotterdam. Jan's older brother Theo (1880-1959) also became an architect and would later become Jan's associate. Jan was trained at a vocational school in Rotterdam, ending in 1898, followed by a study at the Academy of Visual Arts and Technical Science, where he graduated as an engineer in 1901, a year after his brother. In the following years he participated in several competions, without much success. For additional traininbg, he temporarily worked as a draughtsman for architect H. Evers and for civil engineer A.D. Heederik. In 1905 he travelled through Germany, resulting in many drawings of buildings. he also found work at the offices of architects J. Kraaz in Berlin and Ochsenmayer & Wissmüller in Nurnberg. In 1906 he won a competition for the design of a new town hall for the town of Zeist, a building in neo-Renaisance style. In November 1908, after the town hall was completed, Jan began an architect's office in Zeist. He managed to get assigments in Zeist and its vicinity, including the city of Utrecht, working in various historicising styles at first until settling on the Expressionism of the Amsterdam School. Outside the Zeist/Utrecht region there were many assignments in Veendam, a town in the Groningen province. Although modern sources claim that Jan immediately formed a partnership with his brother in 1908, various older sources show that Theo worked as an overseer for the government department of Rijkswaterstaat from ca. 1903 until 1915 at least, the year when he was promoted from overseer 3rd class to overseer 2nd class, and Theo probably did not join Jan's office before 1919. The Stuivinga office was succesful in many types of buildings but was only responsible for a few churches, all of them protestant. 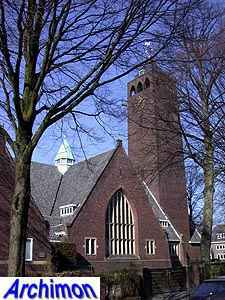 The first of these, the Biltsche Kapel (now Zuiderkapel) in Bilthoven from 1916, was the work of Jan alone. All the other churches were designed in conjunction with Theo, although there is no clarity on the role of each architect, and are in Expressionist style. In the same period the office was involved with at least two churches which are attributed to H.G. Krijgsman, office manager at the Stuivinga firm, while the inventory of the Stuivinga archive attributes the designs to the brothers. 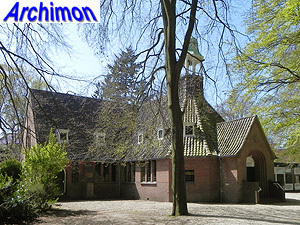 These are a wooden temporary church in Zeist (1921) and the Nassaukerk in Amsterdam (1924). 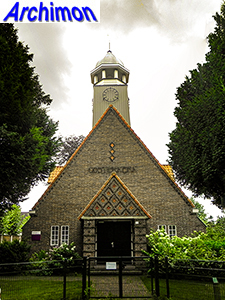 Both churches belonged to the Gereformeerde Kerk, the denomination of which Krijgsman was a member while the liberal reformed Stuivingas were excluded from at least the latter assignment. The aforementioned archive inventory also mentions a church in Veendam, which is as yet not identified. The last church project of the Stuivinga office seems to be for a reformed church in Maarsbergen, as part of a reform school of which Jan was a member of the board. This church was probably not built due to the war. No further church designs seem to have been made after 1940. After that year the office went through a series of short-living partnerships with other architects. Jan Stuivinga retired in 1955, his brother Theo remained with the office until he died in 1959. Jan died the 4th of june 1962 in Zeist. The office continued as Tuynenburg Muys until 1975. It had by that time been specializing in hospitals for more than twenty years. The following is a list of Stuivinga's known religious works only. It is probably incomplete. Two designs were made, one for the enlargement of the existing church, the other for a new church on a different location. Both not executed. Aisleless church in Expressionist style, originally with a pseudo-transept at the end of the nave. In 1935 J. and Th. Stuivinga enlarged the church into a cruciform church. Aisleless church in Expressionist style, with tower at the back. Enlarged in 1951. Big cruciform church in Expressionist style, with influences from Scandinavian architecture. Small aisleless church in Expressionist style. Now housing. Small aisleless church in Expressionist style, largely similar to the Oosterkerk in Enschede except for the tower. Cruciform church in Expressionist style. Details unknown, current church dates from 1873. 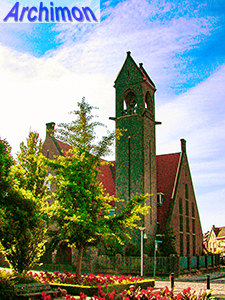 Project for a reformed church as part of a protestant reform school. Probably not build due to WW2.